Micheal Khuraibet, began his career in creative writing in high school and because of his constant preservation, has won first place in the River’s Voice memoir competition. The list of the River’s Voice winners finally posted up last week and among them was the first place memoir winner, Michael Khuraibet. “She treated it as though it was a mourning period, like the loss of her brother.” It was through this frame of a “losing” a brother that helped give Khuraibet a twist to his unforgettable story. His then brother was the one sibling of the three he had the best relationship with due to their closeness in age and the fact that they were brothers among their two older sisters. Together they understood and guided each other in the ways they knew they could. The foundation of their relationship was being close, as siblings, in a family that is like any other. Eventually, Michael Khurabiet moved away from his home in Nevada to better accomplish his goals. 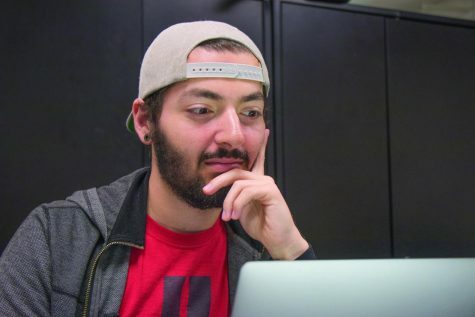 Since then, he has been a student here at Rio Hondo since the Fall of 2016. He is majoring in journalism and communication studies, and hopes to transfer to Cal State Long Beach. Since high school, he found his passion for comedy and script writing through the support and guidance from a “witty” teacher. From then on he has never stopped diving himself into the work of creative short stories and script writing, which are the right path for him given his recent successes. For his future, with his major and talents, Khuraibet hopes to pursue a career in comedy writing. Khuraibet, although the Digital Editor-in-Chief of El Paisano news, likes to spend his weekends on local stages doing his stand-up comedy acts. With each stage and act,s he grows as a stand-up comedian by actively practicing his craft in the long run.